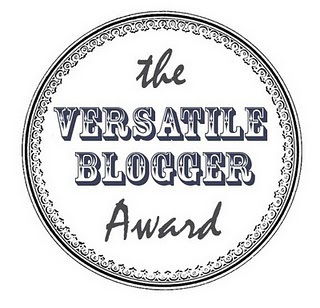 Many thanks to Glitter Aficianado for awarding me the Versatile Blogger Award! There are three simple rules for this award. Link back to the blogger(s) who nominated you. Post seven facts about yourself. Possums do not play possum around me, opting instead to morph into hissing, fanged, razor-clawed creatures with snakelike tails. Thus, I do not like possums. I am half Japanese incognito. On the rare occasions that I’ve called radio stations to request a song, they put me live on the air. This has happened to me six times in my life. The book series I was most obsessed with as a child was Fairytales from Around the World. I’ve always wanted to pilot a helicopter but have never ridden in one. I dream of going to Europe. It took me 90 minutes to figure out how to post this . Linking is now my b*tch. Bloggers I Nominate . . . I agree with Glitter Aficianado that nominating 15 bloggers seems to diminish the prize somewhat, so here is my much more selective list of bloggers who, in my not so humble opinion, deserve a Versatile Blogger Award for making the blogosphere shine. Josie’s Book Corner – My favorite place in the blogosphere. Crohn’s and the Real Girl – Each and every brilliant story is a joy to read. illustr8d – Super intelligent blogger who makes me feel less alone in the blogosphere by commenting even when no one else does. A Simple Life – because she’s the best kind of nonconformist cool. familyrulesbyplainjane – For the kindness and imagination that shine through her every post. Congratulations. 🙂 I enjoyed reading your facts and thank you for the nomination. You’re welcome. Thank YOU for your blog – I enjoy it a lot! Couldn’t wait to see your post – just commented. LOVED reading it. A mile in under a minute? You are a woman of MANY talents. What are the first three places you’d like to visit? I’m thinking Scotland, England, France, in that order. England, France and Italy (more specifically Rome!) I studied art history in high school and I’m pretty much in love with architecture so that’s the reasoning behind Rome. Fun facts! Thanks for participating! Wow, I really loved those little facts about you!! As with you, I also dream about going to Europe. Sometimes I zone out randomly because I’m thinking of running away to travel all around Europe! And that’s so cool, getting aired so many times live on radio! I’d probably freak out. You write so well, and I wish I knew how to dress up my blog as well as you do. Your blog is all decked out in cute clothes; mine is wearing her older brother’s hand-me-downs.